The English language is tricky, even for those of us that speak it! We were at the auto parts store one warm day and I wanted a bottle of water to quench my thirst (by the way, always keep a bottle of water on hand because the humidity can make you thirsty quickly). I asked the proprieter ‘where is the closest market?’, he proceeded to give me directions to a place about 4 blocks away, which was odd because I was sure I had seen a store somewhere in close proximity to his business, just couldn’t remember specifically which direction I needed to go. As I walked away, puzzled at his directions, it dawned on me he just gave me directions to the open air fresh produce market. 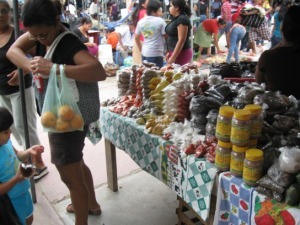 Lesson learned that in Belize when someone uses the term ‘market’ they are referring to an open air, outdoor shopping area which is where you can usually find the freshest produce available to that area. 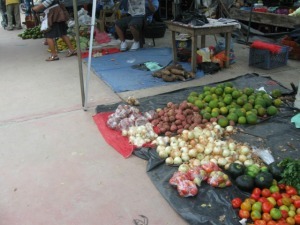 The reason for clarification is because in the US we often called the Grocery store the ‘market’, totally acceptable and interchangeable, not so in Belize. 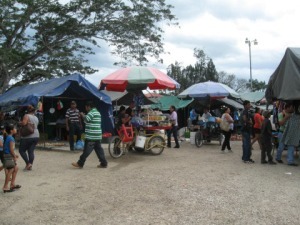 The San Ignacio Market is not only listed on Trip Advisor (currently as the #3 shopping location for the area) as something to be sure to see it is the local gathering place on any given Saturday. The wares that are available on Saturday (and sometimes on Fridays during high season) are everything from an actual nail salon to locally crafted wines, cheeses and healthy potions made by fellow expats. There is a very active food court, which I understand at 6 am, has a large gathering of local men who make it a weekly ritual to meet there for social time…. I will never know since I never intend to be there THAT early in the morning ;-). It’s a hustling, bustling atmosphere and I usually have a reason to go on Saturday, sometimes it is just to visit with friends and other times it is to see what is new and different, because there is always something new. Denny doesn’t like maneuvering around people(aka crowds) so much so he stays home. 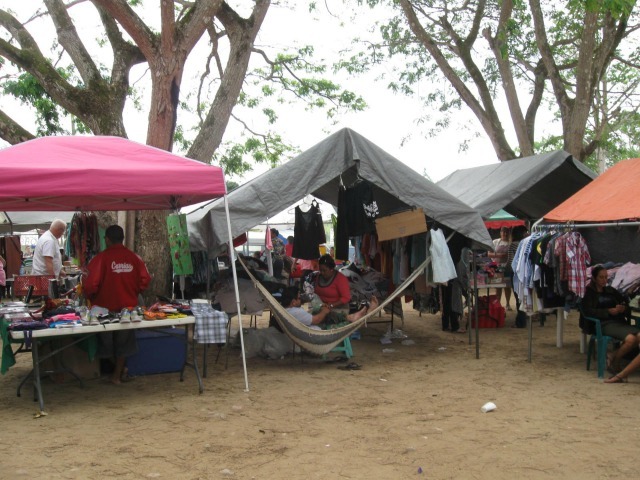 Here is a fun example, there are always dozens and dozens of people selling clothing and a few weeks ago, almost every stall had a sign that said ‘shirts $2’ . Now these weren’t souvenir shirts, they were just regular everyday shirts, I concluded a new shipment of clothes was on it’s way and they were trying to clear out all the things that had been there for awhile. Another expat friend suggested that 1 person put a sign up so everyone followed suit, not to be out-done. Who knows the real reason, but if you were in the need of a new shirt and had time to browse thru things you may have struck gold! 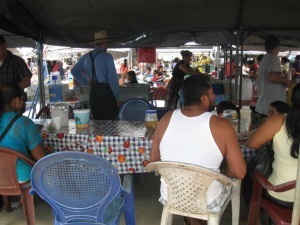 Here are various pictures taken at the San Ignacio Market on a Saturday visit, enjoy and feel free to comment below. 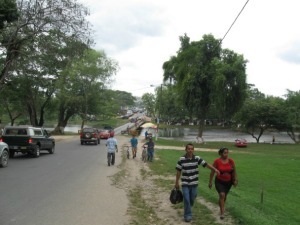 Time to head to the market….just over the bridge on the left is where all the activity is. Some vendors are mobile as well. 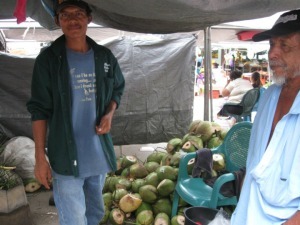 Fresh coconut water vendor, often times he is sold out before mid-day. Food court and early morning gathering place for many locals. Fresh veggies on display throughout the market.